Ecuadorian Shortwave Log - A very detailed log made during four weeks in Ecuador in October and November, 1997. Many loggings include transcriptions of station IDs and announcements. Also names of products advertised, programs, etc. About 50k. Ecuadorian Medium Wave Log - A very detailed log of medium wave stations, mostly Ecuadorian and Colombian, logged while in Ecuador. Many transcribed IDs. About 74k. Venezuelan Medium Wave Log - Introduction. Part one of three. Introduction to my MW log on my Venezuelan trip of 12/94-1/95. Lots of station ID texts and other useful information. 8k. Venezuelan Medium Wave Log: 530 - 990 kHz. Part two of three. My loggings from 530 - 990 kHz. 17k. Venezuelan Medium Wave Log: 1000 - 1615 kHz. Part three of three. My loggings from 1000 - 1615 kHz. 28k. 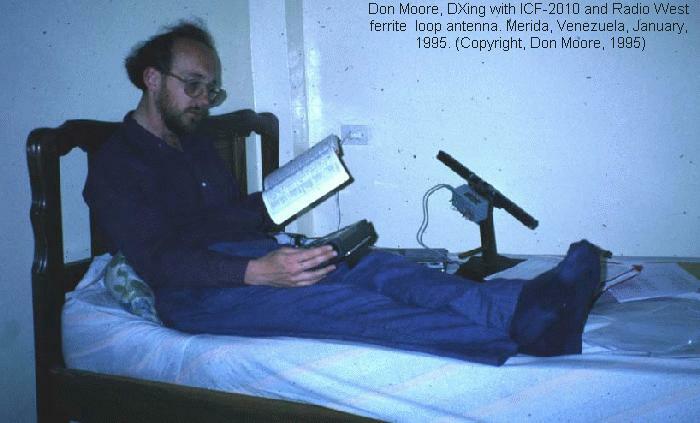 A photo of me DXing in a Merida hotel, on my last day of DXing these logs. The Tapatio Log - A log of stations made while visiting Guadalajara, Mexico in November, 2001. Includes dozens of audio files.